This genus rarely is considered a "good" one. 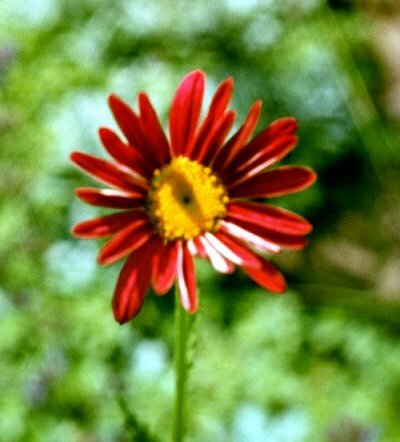 Most species are now usually treated as Tanacetum, formerly but erroneusly it was included in Chrysanthemum sensu lato. Russian taxonomists have treated Pyrethrum as a separate genus. 56 species in the "Flora of the USSR", the bulk of them in the Caucasus and in Central Asia; only 8 are of wide distribution. Some species are already known in cultivation in the FSU and in Europe. Among them are P. carneum Bieb., P. coccineum (Willd.) Worosch., P. corymbosum (L.) Scop. and P. parthenium (L.) Smith, all known under Tanacetum. Some other species have been tested by botanical gardens and deserve special attention. P. kelleri (Kryl. et Plotn.) Krasch. Siberia (southern regions of Altay). On dry rocky slopes. Evergreen plant 40-70 cm when flowering. Rhizome creeping. Flowering stems solitary or few, sparsely leafy. Leaves silver-grey pubescent. Basal leaves long-petiolate up to 20-25 cm x 6-7 cm, with oblong entire blade, margin smooth. Stem leaves few (3-7), short-petiolate with lyrate-pinnatisect blade. Flower head 4-5 cm diam., 1-6 per stem, stalk up to 20 cm. Flowers white, corolla 2 cm. V - early spring until frost. Fl - June-July for more than month. Fr - August. P - by division and seed. Requires a sunny place and well-drained soil. Very attractive species for the flower bed and for the rock garden. Z 5 (4). New.